Vadim Moiseevich Rokhlin (25 August 1937 Leningrad ‒ 25 April 1985 Leningrad) was a Russian nonconformist painter and graphic artist, a distinctive representative of Leningrad’s unofficial art scene of the 1960s–1980s. His work culminated with pieces from his evangelical series (e.g. the paintings “Raspiatie” (Crucifixion), “Nesenie kresta” (Christ Carrying the Cross) and their studies. His famous graphic work includes mainly portraits (members of the family, friends) and illustrations for Mikhail A. Bulgakov’s novel The Master and Margarita. Rokhlin also devoted himself to figural compositions and monumental paintings. A total of more than 1,100 works have been documented. Since he was not an official artist, he did not have an opportunity to exhibit his works during his lifetime. Besides the several-day exhibition of student works in the atrium of the Faculty of Architecture of the Leningrad Civil Engineering Institute at the end of the 1950s, he participated in only two non-public joint exhibitions in the flats of his Leningrad colleagues-artists in the middle of the 1960s. 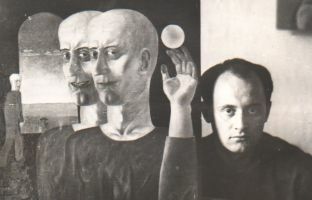 The Soviet public had the first chance to see several of his works in the middle of the 1970s at two short-term joint exhibitions of independent artists (the so-called Gaznevshtina). Further (already posthumous) exhibitions (three of his own and two joint) were enabled by the Perestroika Period. In the second half of the 1990s, several exhibitions were held in the USA and Western Europe (mainly thanks to the Jane Voorhees Zimmerli Art Museum in New Brunswick, New Jersey, whose collections contain the highest number of Rokhlin’s works). In Russia, the richest collection of his works can be found in the Russian Museum in St Petersburg. In 1954‒1960, Vadim M. Rokhlin studied the Faculty of Architecture of the Leningrad Civil Engineering Institute. After he completed his studies, he worked as an architect at numerous Soviet design institutes: “Goskoľstroiproekt” in Murmansk (1960), the Kola branch of the “Gipronikeľ” institute in Monchegorsk (1960‒1963), and “Lenproekt” (from 1976 “Lenniiproekt”) in Leningrad (1963‒1980). In 1980‒1984, he worked as an art teacher at the Vyborg District Palace of Pioneers in Leningrad. The collection of documents owned by the Slavonic Library has the size of 1 rm; the materials are placed in 9 archival boxes. The collection was acquired by the library in 2008 as a donation from V. Rokhlin’s wife, Tamara I. Fedorova. various – articles and magazines; correspondence of other people; texts by other authors; exhibitions of other artists (materials and invitations); works of art by other artists. The collection contains mainly written, photographic and printed documents related to the life and artistic activities of Vadim M. Rokhlin and the activities of his wife Tamara I. Fedorova. V. M. Rokhlin’s artistic work is mainly represented by auxiliary materials documenting the course and circumstances of the creation of some of his works. With the exception of a few sketches, the collection does not contain any Rokhlin’s artistic production. His architectural work is represented especially by three panoramic side views of Nevsky Prospect. A dominant part of the collection comprises the agenda of exhibitions of Rokhlin’s works and materials concerning the cataloguing of his work (including the process of the preparation of a synoptic catalogue of his works Vadim Rokhlin and the memorial monograph Vadim Rokhlin v vospominaniakh rodstvennikov i druzei). Chronologically, the documents are related to the period from the 1930s and the 1940s and the middle of the 1980s, in the case of later exhibitions with an overlap to the turn of the third millennium. The materials of T. I. Fedorova deal with both the cataloguing and evaluation of V. M. Rokhlin’s work on the one hand and the transfer of his works into gallery collections and the organization of exhibitions. The earliest document of the entire collection is a postcard of Smolensk with the text from November 1922, the latest is the last part of Tamara I. Fedorova’s “diary entries” and correspondence, both from 2013. The highest informative value is provided by background materials (original texts, memoirs, targeted discussions…) for both publications, presenting Vadim Rokhlin’s life and work in their entirety, as well as by the collection of photographs, serving as a “generational” pictorial chronicle of the Russian middle-class intellectual Jewish family from the turn of the 1930s until the end of the 1960s (with an overlap to the collapse of the USSR). Documentary value can be found in Tamara I. Fedorova’s “diary entries” recording the events in V. M. Rokhlin’s life and work from the end of the 1970s until the early 2010s as well as in her descriptive comments and information on many documents (in many cases, unfortunately, written thoughtlessly directly in them, which reduces the authenticity and originality of the materials).